Packed with industry-leading carbon technology, and fitted with a premium groupset, the Orro Gold STC Disc Ultegra 8000 road bike lives up to its name. Orro collaborated with British carbon producer, Sigmatex to create their carbon frames, using technologies developed from years in the automotive and aerospace industries. The geometry has a balance between aggressive racing angles and endurance comfort, a versatile shape that caters to a variety of riding scenarios. The super lightweight fork is a monocoque design and full carbon from steerer tube to blades. Shimano’s all-new Ultegra 8000 groupset borrows a lot of technology from the top-flight Dura Ace series to deliver a race-winning-capable 2x11 speed drivetrain. This bike comes with the added benefit of Ultegra hydraulic disc brakes, giving impeccable braking performance come rain or shine. 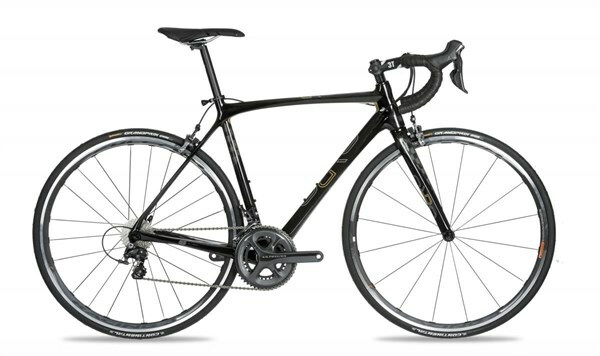 Every squeeze of the brake, every click of the shifter, every turn of the cranks, the Orro Gold STC Disc Ultegra rewards you with a satisfyingly swift performance. Rolling on Fulcrum R500 DB disc-specific wheels show with 25mm Continental Grand Prix tyres, this bike confidently swoops around corners and accelerates up to speed with the minimum of drama.